Suspicion surrounds Iris, a local waitress and Savannah's new best friend. 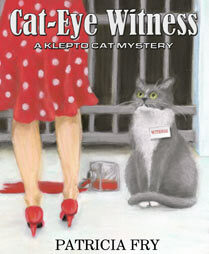 The only witness to the murder is Rags, Savannah's cat. With the assistance of a cat psychic and Rags's good friend, Charlotte (the young girl with Downs), the cat helps to "paw" the killer...but not before an attempt is made on Rags's life. The case is solved only after Rags comes face-to-face with the killer for the second time. Detective Craig Sledge is new to this book, as is Damon, Iris's errant son. Sledge finds this to be one of the muddiest cases he has ever worked, with inconsistent clues and no apparent motive. He's constantly surprised, perplexed and impressed by the cat's uncanny ability to come up with clues he has missed. His fascination with the attractive Iris Clampton also mystifies the detective. In this story, one of the rescued horses goes into labor and there's a night of high drama at the ole corral as veterinarians Savannah and Michael work to save the foal. This experience renews Savannah's deep interest in horses and riding, which ultimately serves to help her bond with a very important surprise character who finds his way into her life and Michael's just as they prepare to say their wedding vows. While Rags is the animal star, he isn't the only animal featured in this story. Layla is back in all of her tangerine beauty. And Rags makes friends with Buffy, a perky almost Himalayan and the inseparable duo, Walter, an all black cat and his sidekick, Lexie, a charming afghan mix. Savannah's new ride, Peaches, also debuts in this story. An incident with this mare adds another dimension to Savannah's and Michael's relationship. Can he hold her with open arms? Some say this is a love story with a mystery in the background. And it's a story of family and friendship as newlyweds Margaret and Max continue to be a meaningful part of Savannah's and Michael's world. See a few of the reviews that have appeared on Amazon.